A powerful lamp for lighting large surfaces: squares, parking lots, halls, halls courts. In the calculation, we compared the lamp to light bulb, but the bulb still needs luminaire and lamp is complete. LED lighting technology is worthwhile. Did you know that the LED lamp 400 can replace HQI-T 1000 !!! It can be used indoors and outdoors. Do you have commercial property, hall events, ... You must have it - PROFESSIONAL LED LAMP NOW IN THE NEW PRICE !! What is COB? 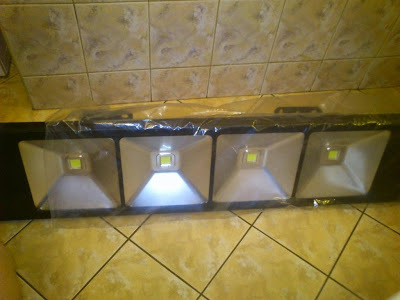 - It's a new construction technology of LED lighting. COB (Chips on board), which led wielozłączowa on one disc packed with a large quantity of chips. This technology is very efficient.